We all have those days where we aren't given the luxury of having hours on end to perfect our faces, and sometimes you need to have a routine in check for mornings (or afternoons, you do you boo) where time is not on our side. For me, this face is limited to five holy grail products which are super effortless and rush-friendly! A base I've been loving lately is the Make Up For Ever Ultra HD Foundation; this has outstanding coverage whilst still looking pretty natural on the skin, it's quite a thin/liquidy consistency which makes it incredibly easy to blend and buff out just in the nick of time. I find that concealer isn't necessary when I use this, which is why it's so perfect. I set my foundation with the Laura Mercier Translucent Powder and highlight the under eyes with the banana powder in the Anastasia Beverly Hills Contour Kit. I usually then continue to bronze up my face and quickly add some depth to my cheekbones; this step is completely necessary for me as it's what takes me from looking like I've just come straight from my bed (which, to be honest, I probably have) to actually looking half decent and presentable. If you follow me on instagram you'll know that there's not a single brow product I love more than the Anastasia Brow Definer, the formula of this product means it glides on effortlessly onto the brow, and due to its unique shape, filling in the brows takes seconds! And the final step in this five minute face which definitely can't go amiss, of course, the highlight. I can't remember the last time I left the house without a glow, I find that the Anastasia Starlight Illuminator is the perfect white, pearlescent highlight for a pale gal like me, and it really brings the look together. On days where I'm rushing to get myself ready, I tend to give mascara a miss as my lashes are pretty long and dark on their own so I can get away with it. Whack on a tinted lip balm or lipstick of choice and voila, you're good to go! 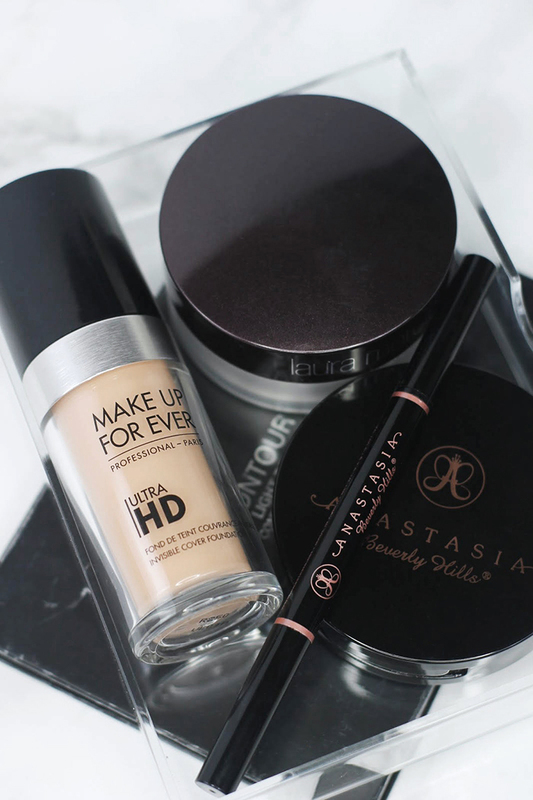 What are your go-to products for a rushed morning? *Products and items featured on my blog may have been sent through PR for review. Many items I have also paid for myself. All opinions are honest and my own, and are not influenced by brands or companies. for more information see my disclaimer.